Human Rights Watch has released a new report, “Old Behind Bars: The Aging Prison Population in the United States." 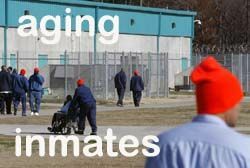 Aging men and women are the most rapidly growing group in US prisons, and prison officials are hard-pressed to provide them appropriate housing and medical care, Human Rights Watch said in a report released today. Because of their higher rates of illness and impairments, older prisoners incur medical costs that are three to nine times as high as those for younger prisoners. The Oklahoman has an article today highlighting elderly non-violent defendants in drug cases who are sentenced to terms that, due to their age, amount to a life sentence. Often, these seniors' offense is selling their own lawfully obtained precription pills. Oklahoma Bureau of Narcotics and Dangerous Drugs Control spokesman Mark Woodward said the argument is sometimes made that selling prescriptions becomes the only way for the elderly to supplement Social Security benefits and make money. Check out these photographic exhibitions of aging and ill prisoners: Tim Gruber's Served Out – Aging and Dying Behind Bars and Grace Before Dying [More...].